Front of the recipe card for Broccoli Saute With Almonds. 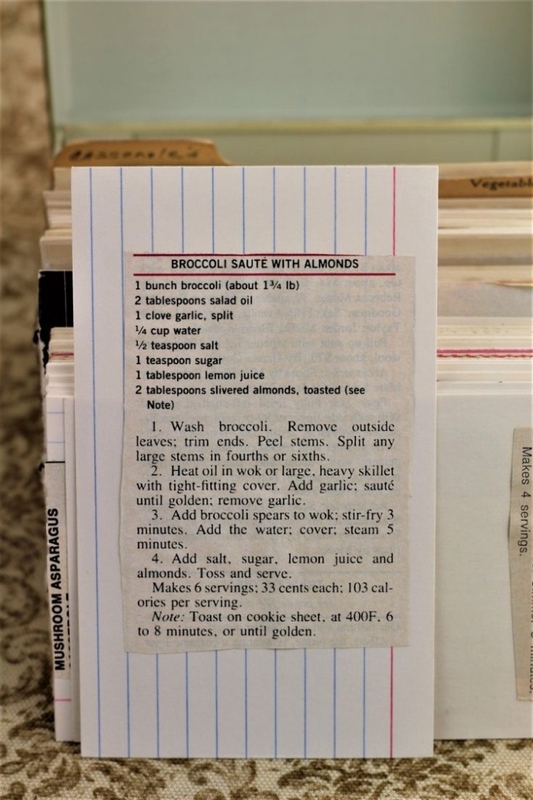 There are lots of fun recipes to read in the box this recipe for Broccoli Saute With Almonds was with. Use the links below to view other recipes similar to this Broccoli Saute With Almonds recipe. 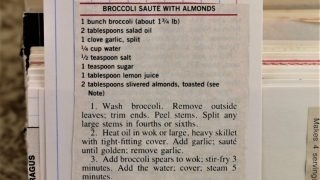 If you make this Broccoli Saute With Almonds recipe, please share your photos and comments below! Wash broccoli. Remove outside leaves; trim ends. Split any large stems in fourths or sixths. Heat oil in wok or large, heavy skillet with tight-fitting cover. Add garlic; saute until golden; remove garlic. Add broccoli spears to wok; stir-fry 3 minutes. Add the water; cover; steam 5 minutes. oss and serve. Makes 6 servings; 33 cents each; 103 calories per serving. Note: Toast on cookie sheet, at 400F, 6 to 8 minutes, or until golden.